When I for the first time got to see a computer game I was totally hooked! It was “Gunman” on the “Philips Videopack G7000” aka “Magnavox Odyssey 2”. Gunman is a game where you have a gunfight against either the computer or a human player. There are lots of trees in the way and if you shoot at them, the shots will bounce around. That makes it possible for a player to hide behind the trees or use the trees to bounce the shots in very strange directions between the trees in hope of hitting the other player. This action may end up with shooting oneself. To be able to play this simple little game was the most fascinating thing I have ever done. I played it just recently with my childhood friend who I played with back in the old days and we laughed for hours. It's still a very fun multiplayer game. G7000 had one big problem. It's joysticks. 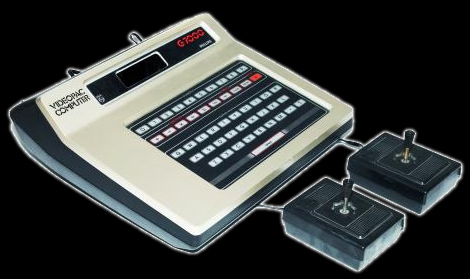 I do not think I was ever able to play more than 1 hour without any of the buttons breaking and they had no ergonomic design what so ever. It was literally a pain playing and that is almost an accomplishment due to the fact that I was not able to play for very long before they broke. I later modified the console by adding 2 "9 pin D-shell" connectors1 to be able to play with my favorite sticks such as TAC-2 or Konix Speedking. 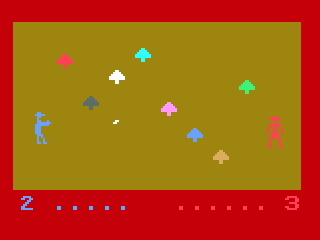 There were 2 very unique titles which combined a table top game with the computer game. My friend bought "Conquest of Worlds" while I bought “Quest for the Rings”. The outcome of the battles on screen changed the movement of the tabletop map. I never bothered to play with the table top. The computer game was good enough without it. At that time I had no knowledge of English what so ever and didn't understand at all why all of the sudden I got to play another character than before. It took a while before I noticed that according to what text that were scrolling at the bottom of the screen, your character changed . The words were “Warrior”, Wizard, “Magician” and “Phantom”. What an excitement to be able to kill horrific monsters and try to sneak past a gigantic dragon that covered half the screen! Well… it felt that way back then. Take a look for yourself at the horrific firebreathing dragon on the screenshot below. 1. This port supports Atari-style digital joysticks. Those joysticks are named Atari, as this joystick type was first introduced in the Atari 2600 and then adopted to home computers such as VIC 20, Commodore 64, Amiga, MSX-computers and even Sinclair Spectrum.